In a booming IT industry, there is no dearth of programming languages. It is simply a matter of choice based on your specific needs, and which programming language and technology platform best fits to those needs. Whether you are a beginner or an experienced programmer, there will always be a point in your career where you will be in the quest to find the answer to the question: Which programming language should I learn now/next? Relevance is an important aspect. Before you learn any programming language, you would want to make sure that learning it today will be as relevant as it will be five years from now and further on. There is this buzz about Python programming that cannot be ignored. In this article, we would try to understand why so many people are willing to learn Python today? What are its long term implications? And what it means for our careers? Python is the fastest growing programming language in the world today. Naturally, there is enthusiasm among students, fresher’s, and experienced professionals to learn it and include it in their repertoire of technical skills. Professional training and certification in Python programming can inflame this fire in the belly to considerably raise one’s expertise ever more and better ever. As they say, ‘save the best for the last’, we’ll elaborate about Python training course in the concluding portions of this article. Let’s first take a dig on what makes Python programming such a formidable language that is gaining popularity day by day. Python, as a general purpose, object-oriented programming (OOP) language can be used to build almost any type of application, and thus finds its application in diverse fields, right from web development, data analysis and data science, artificial intelligence, and scientific and mathematical computing, to desktop apps, games, and productivity tools. With about 125,000 third-party libraries, Python’s versatility can be leveraged to achieve application development from traditional, such as web and desktop apps to state-of-the-art, like Artificial Intelligence and Machine Learning purposes. A language’s popularity depends upon how easily it accommodates the latest, disruptive technologies. On this front, Python scores 10 on 10 as it is blessed with numerical computation engines such as NumPy and SciPy that eases complex calculations. Raspberry Pi with Python programming language can be used to build robots, machines, and gadgets. Python has been slowly and significantly replacing MATLAB as the future of Artificial Intelligence. With libraries such as scikit–learn, Keras, and TensorFlow, Python is set to rule the Machine Learning domain. The rise of Big Data has been instrumental in increasing the demand for Python developers in Data Science. Since Python can be easily integrated into application development, tasks that require machine learning can be easily carried out with Python programming. On-demand Jobs + Top Salary = Best Growth! 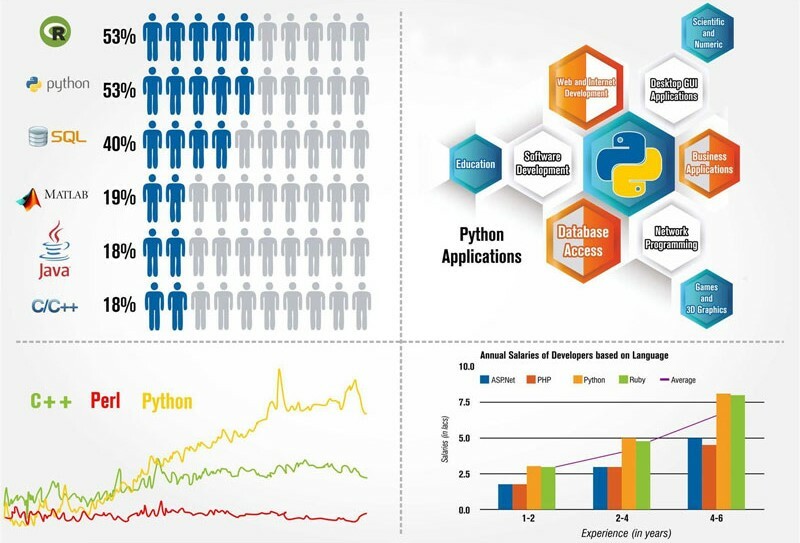 You call it Python’s versatility or its association with cutting-edge technologies, when it comes to demand and growth, Python is on the top. And consequently, the remuneration for certified Python professionals is also on the higher side. If you ask an ambitious IT professional about her short-term or long-term goals, it is certain to boil down at bright career prospects and growing salary. Python is conducive for both. Success for a start-up is a distant dream. It is materialized with small but significant steps in the right direction. As customer satisfaction is at the heart of enterprise success, an ideal solution is one that can be built quickly with minimum features and solves customer’s problems at hand. The iterative step of converting an idea into deliverable is continued till the final product or service is offered satiating the customer’s needs. Python developer fits perfectly in this scenario since you can code faster with Python. For a particular feature or module, Python requires lines of code 5 times less than Java, and 10 times lesser than C++. How’s the Future of Python Developer? It is bright! A general-purpose programming language, Python is used for web development, as a support language for software development, in applications used in scientific computing, data analysis and machine learning. You name the sector and Python developer will find their way to effect. In particular, the growth and demand of Artificial Intelligence, Machine Learning and Deep Learning is on the rise among enterprises. In an era where technological innovation and digital transformation has been prevailing over due to these disruptive technologies, the requirement for Python programmers will continue to surge ensuring a bright future for them. Why be a Cognixia Certified Python Developer? In a market where there is an increasing demand for Python developers, it is conducive to incorporate this skill into your arsenal. Python training and certification from a recognized and professional training provider is one of the best ways of achieving this. Cognixia – A Collabera LEARNING SOLUTIONS COMPANY provides comprehensive Python training to students and professionals. Our course structure, training material and practical sessions are devised by industry certified, seasoned trainers. We are an Authorized Training Partner with Google, Enterprise Training Partner with RedHat, Silver Learning Partner with Microsoft, Community Partner with Hortonworks, and Advantage Partner with MapR, which means our certificate holds a prestigious value in the technology market. If you want to enhance your career growth as a Python developer, you ought to be prompt and Enroll with Cognixia today!